MEAA is an affiliate of the International Federation of Journalists (IFJ) – the world’s largest organisation of journalists, represents 600,000 media professionals from 187 trade unions and associations in more than 140 countries. Established in 1926, the IFJ is the organisation that speaks for journalists within the United Nations system and within the international trade union movement. The IFJ is headquartered in Brussels. The IFJ Asia-Pacific regional office is located in Sydney and is hosted by MEAA. The IFJ Asia-Pacific office represents 30 affiliated unions and associations in the Asia-Pacific region. IFJ Asia-Pacific works with national journalists’ unions and associations to improve the conditions of journalists and the quality of journalism through training programs and advocacy campaigns in defense of media-related rights, including the right to safety and decent working conditions, the right to freedom of expression, the right to a free media, the right to access information, the right to freedom of association and the right to justice and fair legal proceedings. The IFJ does not subscribe to any given political viewpoint, but promotes human rights, democracy and pluralism. The IFJ is opposed to discrimination of all kinds and condemns the use of media as propaganda or to promote intolerance and conflict. The IFJ believes in freedom of political and cultural expression and defends trade union and other basic human rights. The IFJ is the organisation that speaks for journalists within the United Nations system and within the international trade union movement. 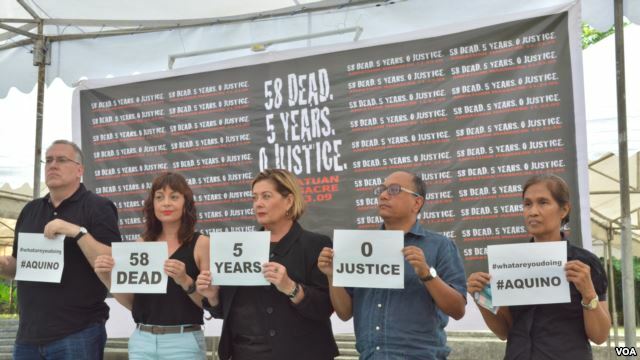 The IFJ supports journalists and their unions whenever they are fighting for their industrial and professional rights and has established an International Safety Fund to provide humanitarian aid for journalists in need. IFJ policy is decided by the Congress which meets every three years and work is carried out by the Secretariat based in Brussels under the direction of an elected Executive Committee. 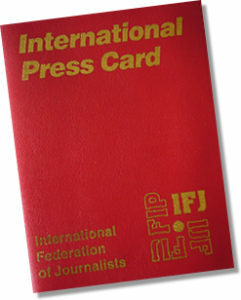 The IFJ International Press Card (IPC) is recognised the world over and is the only press pass endorsed by national journalists’ groups in more than 130 countries. It provides instant confirmation that the bearer is a working journalist. It is only issued to genuine journalists who are committed to ethical standards and solidarity between media professionals. The IPC connects journalists globally and ensures that IFJ affiliated organisations extend to the IPC bearer assistance and courtesy in the performance of her/his mission. Journalists travelling in conflict zones have testified to the benefits of the IPC. It has helped many journalists get out of tricky situations in dealing with soldiers, police or officials. The IFJ does not issue press cards directly to individual journalists. In order to apply a journalist MUST be a member of a union or association affiliated to the IFJ. For Australian journalists, this is MEAA. You can download MEAA’s IFJ international press card application form here. Once issued, the card is valid for two years. Please contact MEAA Member Central to learn more about the card. Note that you must be a financial MEAA Media member to be eligible. The IFJ has joined forces with a major insurance company to unveil a new cost-effective insurance scheme covering all media workers without restriction in any region of the world – including war zones. Many insurance companies refuse to insure news professionals working in dangerous areas, or do it at very heavy costs, which results in many reporters and freelancers, including fixers and technical staff, covering news in some of the world’s most dangerous countries without the safety net of an insurance policy. Now the IFJ has joined forces with ‘Insurance for Journalists’ to provide the opportunity for cover for all its affiliates’ members working on assignments anywhere in the world. ‘Insurance for Journalists’ is an insurer specialising solely in insuring media staff, without restrictions, following them wherever their next assignment may take them. Every policy provides cover for accidental death and disablement plus emergency accident and sickness evacuation and repatriation from anywhere in the world including hostile regions to the policy holders’ country of residence when required. The insurance policies have been developed with the assistance of a team of journalists led by Frank Giglio a former news production manager with 42 years’ experience gained working in the field for ABC and Fox News in consultation with IFJ staff. “The majority of news organisations and media outlets rely on the freelance community to cover breaking news, documentaries and special events, it is essential that each individual or group are properly insured ,” said Giglio. The IFJ 25th annual report on journalists and media staff killed (1990-2015) recorded at least 2,297 media professionals killed in the last 25 years with highest death rates in Iraq (309), Philippines (146) and Mexico (120). Although safety training is an essential way to minimise journalists’ risks abroad, more is needed to provide media colleagues with the safest working environment. Anthony Bellanger, General Secretary of the IFJ said: “While careful planning remains the most important part of newsgathering, no media worker should be excluded from access to a decent and global insurance covering all risks. The IFJ has been working with ‘Insurance for Journalists’ to offer an affordable comprehensive insurance scheme for all our affiliates’ members worldwide”. All policies are provided by IOMA Insurance in conjunction with Lloyd’s of London, the specialist insurance market. Insurance cover starts from as little as €12 per week for €100,000 cover and policies can be obtained in matter of minutes online here. Holders of the IFJ International Press Card will benefit from a 10% discount on any policy offered by “Insurance for journalists”. IFJ Asia-Pacific works with journalist unions and associations in the region to run international campaigns on journalists’ safety, press freedom, public service values, editorial independence, ethics, gender equality, children’s rights, tolerance and decent working conditions. Afghanistan, Australia, Bhutan, Bangladesh, Cambodia, China/Hong Kong, India, Indonesia, Japan, Korea, Malaysia, Maldives, Mongolia, Myanmar, Nepal, New Caledonia, New Zealand, Pakistan, Philippines, Sri Lanka, Thailand, Timor L’este, Taiwan and Vanuatu.